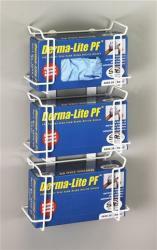 We offer single, double and triple dispensers that now allow you to create the glove dispensing system that you need � both in sizes and styles of gloves. Our unique side loading � left & right, �Side-Slide System�, allows you to maximize space and efficiency with any combination of dispensers. This unique design will accommodate all standard glove boxes. Our sturdy dispensers are constructed from 7 gauge wire and are powder coated in white for maximize protection and a clean appearance. Our mounting brackets allow for convenient mounting and all hardware is included. 10 1/2" x 4 1/4" x 20 1/2"